Barry Melrose has been fired from his job as head coach of the Tampa Bay Lightning. I’m not sure this will really help the Lightning, but it’s certainly not going to do any harm. I thought Melrose was a laughable pick for coach over the offseason, but he’s not their only problem. I just hope that Smitty continues to play well. First goalie to ever win the Vezina and not make the playoffs: it’s happening this year! Niklas Hagman has been on fire in Toronto. He has 2 goals and 2 assists in the last two games (both against Carolina). Sadly they lost the first game and lost the second game in overtime. The goalies in Leafs Land aren’t performing that well, but their defense rarely performs in front of them either. Yes, Hagman still does his super cute/awesome goal expressions and he has the best smile of any Finn I’ve ever seen. Jeff Halpern skated with the Lightning for the first time today, and is scheduled to come back sometime in mid to late December. He’s been skating on his own for a little over a month, but he joined the team at practice for the first time today. He says he hopes to begin skating full-contact in 3 weeks. It’ll be great for him to get back on the ice. Tampa could use the defensive and scoring help. Jason Arnott and Teppo Numminen are the only two ex-Stars to be on the All-Star ballot for this season’s game in Montreal. I don’t see either of them making the starting lineup, but it’s nice to see them on the ballot. It’s also great to see Numminen well enough to be playing again. 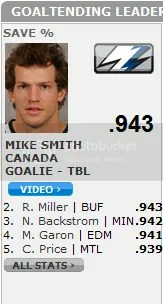 Mike Smith, however, is NOT on the All-Star ballot, so he will be my write-in candidate for the East. He is still in the Top 5 for save percentage and goals against, and is single-handedly supporting a Tampa team that has a lot of [questionable] talent but isn’t producing much. I predicted that he will be the first (?) goalie to win the Vezina and not make the playoffs. Hopefully that won’t happen, he deserves to make the playoffs. I think that’s it for the important update. Mittens has calmed down since the Wild lost to Dallas, and Jussi scored a goal against the Sabres last week. Niklas Hagman scored his first goal for the Leafs yesterday afternoon against St. Louis. The Leafs ended up losing 5-4 in a shootout, but Haggy got the goal to go ahead 4-3. I hope this is the first of MANY goals for him in Toronto this season. He doesn’t look so terrible in blue, but he looked better in a Stars jersey. Mittens scored 2 goals in the Wild’s 4-2 victory over Atlanta tonight. I know a lot of people didn’t like him here in Dallas, but I was always fond of him… probably because he’s Finnish. Hopefully he will go well with the Wild last year. He’s a talented player who might have just needed a change of scenery. As for our Tampa boys, Smitty has played REALLY well. He’s stopped 35-40 shots the two games he’s played, but he’s yet to get a victory. Tampa’s scoring threats of Stamkos, Vinnie, St. Louis, etc haven’t really pulled through. I don’t think they’ve gotten more than 20 shots in a game. Jussi was in the middle of a lot of trade rumors over the summer, but he’s played well enough this season to make Tampa want to keep him. Jeff Halpern has been skating for about an hour each day, and he should be back some time in December. Get well soon Jeffy! The Stars play at home tomorrow night against Trashville, and hopefully they can get their first win of the season… I’ll actually get to watch the game, so maybe I can give them good luck! Game 1 is tonight guys! 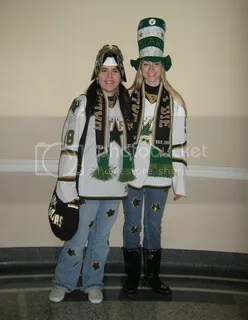 For all of you going to the watching party at AAC, have lots of fun for me! I’ll be watching the game while I study for my stats final… doesn’t sound nearly as much fun as being at the AAC. In other Lightning news, it’s rumored that Tortorella will be headed to Toronto and Barry Melrose will be taking over as coach for the Bolts… I have no idea if these rumors are true, but I hate Barry Melrose with a passion. I’d find it pretty amusing if 3 guys I really cared about weren’t involved with this disaster of a team.